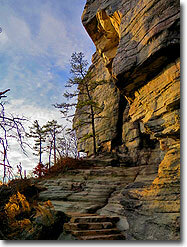 Pilot Mountain is truly one of the iconic summits in North Carolina. A monadnock and the westernmost peak of the ancient Sauratown Mountains, this peak dominates the surrounding Piedmont and can be seen from many landmarks. Due to its ease of access directly off freeway U.S. 52 north of Winston-Salem, this state park is popular and is overcrowded during the summer months. Avoid the crowds and hike this park in the offseason when the leaves are down and the temperatures are milder than the Blue Ridge Mountains. A full loop of the mountain can be achieved using the newly extended Mountain Trail, with the addition a result of a fire break during a forest fire in November 2012. From there use the Grindstone Trail, the only trail leading from the base to the summit area. Once you attain the crest you are in cliff heaven as the trails hug the top and bottom of 100+ foot cliffs crawling with rock climbers. The highlights may be the Ledge Spring Trail, Little Pinnacle, or the Jomeokee Trail, it all depends on your preference. For those in a rush or wanting a shorter hike, you can do the shorter 2.7-mile loop from the upper parking lot. Mile 0.0 – At the visitors center cross the street to find the trail heads for the Grindstone Trail (blue circle blaze) and the Mountain Trail (red circle blaze). Turn left following the Mountain Trail east. You can also do this hike in the counterclockwise direction by following the Grindstone Trail. Mile 0.2 – Y-junction with the Grassy Ridge Trail (white triangle blaze). Continue right on the Mountain Trail which circumnavigates the southern base of Pilot Mountain through hardwood forest and multiple fire-scarred areas. Mile 1.2 – T-junction with the Mountain Trail Connector (red circle blaze) to the Corridor Trail parking area. Mile 2.6 – Begin areas of widespread forest fire damage from November 2012 on the southwest area of the mountain. You will have intermittent winter views west. Mile 4.1 – Mountain Trail ends at Grindstone Trail junction. 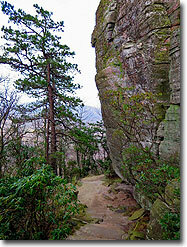 Turn right on the Grindstone Trail (blue circle blaze) which moderately ascends the western side of Pilot Mountain. Mile 4.7 – Y-junction with the Ledge Spring Trail (yellow circle blaze). Veer left to follow the combined Grindstone/Ledge Spring trails. This is the start of a 2.7-mile double loop around the top of the mountain, so you can choose either direction. Mile 5.2 – The trail opens up to the south as a long series of cliffs are located close to the trail. These are easy to explore and have many climbers’ paths paralleling the trail. 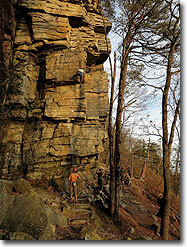 You’ll probably spot rock climbers at the cliff edges. Mile 5.4 – Arguably the largest of the south-facing cliffs off the Grindstone Trail. From here you have a 180° view south of the Piedmont towards Winston-Salem, as well as bird’s eye views of neighboring cliffs dotted with climbers. Mile 5.5 – Grindstone Trail ends at the summit parking area. Follow the sidewalk around the rim. There are multiple observation areas and informative signs around the parking lot. Mile 5.6 – Turn right on the spur trail (no blaze) to Little Pinnacle Overlook. Mile 5.7 – Trail ends at Little Pinnacle, a minor summit and the easternmost point of the band of cliffs along the Ledge Spring Trail. 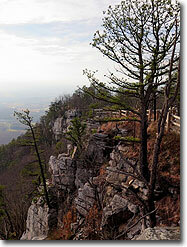 From here you have a fantastic view of the towering Big Pinnacle, the main summit of Pilot Mountain. Just to the left of Big Pinnacle in the distance are the eastern Sauratown Mountains, with Sauratown Mountain in front of Moore’s Knob (left) and Cook’s Wall (right). You also have views south of the Piedmont and views north of the Blue Ridge Escarpment around the NC/VA border. Mile 5.8 – Turn right to begin the Jomeokee Trail (no blaze), a short loop around the base of Big Pinnacle. Initially the trail ducks below Little Pinnacle. Mile 5.9 – Ledge Spring Trail (yellow circle blaze) turns right under Little Pinnacle. You will take this trail on the return. Briefly after this junction the Jomeokee Trail will split. You can take either direction, it is a 0.5-mile loop around the base of Big Pinnacle. This hike describes the clockwise direction. There is no access to the summit as the cliffs are a protected natural landmark, primarily for bird nesting. Climbing on the cliffs is a misdemeanor. The trail is immaculately maintained around the base with many interesting cliffs and rock features. Mile 6.2 – Views east of the Sauratown Mountains. Mile 6.4 – At Y-junction turn left onto the lower leg of the Ledge Spring Trail (yellow circle blaze). For the next ~0.8-mile you will follow the base of the southern band of cliffs you hiked on previously. 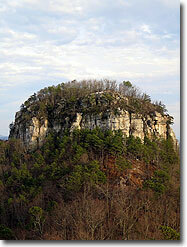 There are many climbing routes along this section, and the cliffs range from 30-80 feet. Mile 6.9 – Three Bears Gully, a popular fault in the cliffs that is a scrambling shortcut for hikers and climbers. 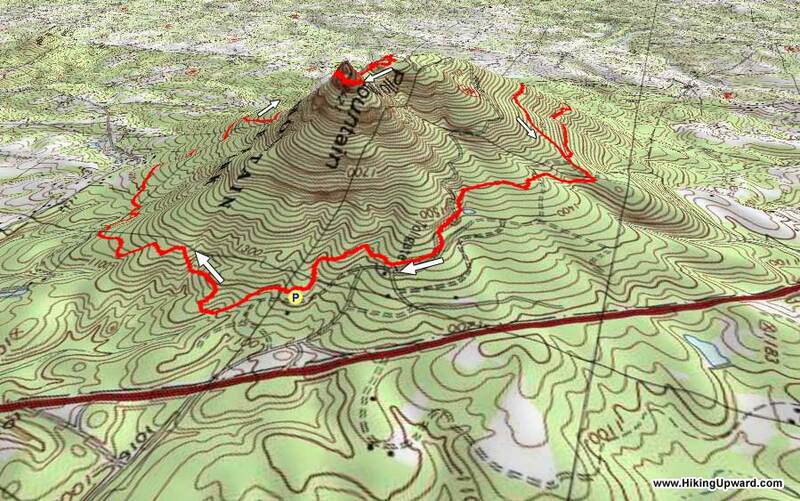 Mile 7.4 – Ledge Spring Trail ends at Grindstone Trail (blue circle blaze). Follow the Grindstone Trail down the mountain. Mile 8.0 – Junction with the Mountain Trail (red circle blaze). Mile 8.1 – Stay right at a trail junction near a small building, the Mountains-to-Sea Trail (white blaze) goes left here towards the town of Pilot Mountain. Mile 8.3 – Service road leads left to Grindstone family campground. Mile 8.4 – Spur trail leads left to Grindstone family campground. Mile 8.7 – Y-junction, trail turns left to join service road. Mile 8.9 – Trail crosses the park road passing bathrooms beside an alternate hiker’s parking area for the Grindstone Trail. Mile 9.3 – Hike ends back at the visitors center. GREAT hike! I chose to modify the route a bit, heading straight up to the summit via the Grindstone Trail first to be sure I had the energy for "strenuous" early in my hike, and then returned back to the Visitor's Center via the Mountain Trail. On a brisk Saturday morning with clear blue skies, the views were awesome and the sunshine was warm. Saw several groups of climbers scaling the cliffs. This hike is already on my "do again" list! Did the full loop as a run the downhills and flats/hike the uphills to fit in a quick hike. I was TIRED after, and it was hot, but it was actually a really fun loop! I messed up and went to the right at the Ledge Spring trail split, and that definitely challenging. Lots of big rock steps, but had fun watching some climbing groups. Coming down I went the Grindstone/Ledge Spring piece and it was much easier and nicer grade! I hiked around quite a bit at Pilot Mountain after rock climbing with Blue Ridge Mountain Guides. For the This park has so many opportunities, I am looking forward to going back for photography and trail running. Really loved this place and will be going back soon!